"Rabbit's clever," said Pooh thoughtfully. "Yes," said Piglet, "Rabbit's clever." "And he has Brain." "Yes," said Piglet, "Rabbit has Brain." There was a long silence. "I suppose," said Pooh, "that that's why he never understands anything." The Tao of Pooh is a guidebook to happiness. Benjamin Hoff's philosophical spin on the beloved Winnie-the-Pooh stories walks us through Milne's Hundred Acre Wood from a Taoist perspective. He inserts himself into Pooh's world, imbuing the instructive narrative with playful fictional interactions between Milne's characters and himself, almost as if recounting a timeless bedtime story. The chapters are set against the scenic backdrop of Pooh's idyllic adventures, and as with many parables of yore, they channel universal truths and observations about people and life and the world around us. In his illustrations of Taoist ideals hidden within the pages of Winnie-the-Pooh and The House at Pooh Corner, Hoff shares with the reader lessons from which anyone can discover value. Taoism is just as Pooh just is. The essence of Taoism is the Uncarved Block or P'u. It's a principle that emphasizes that things in their original simplicity contain their own natural power, and that balance should be respected. Those of the Uncarved Block, once freed from elements that get in the way (e.g., arrogance and complexity), discover a simple, mysterious truth: life is fun. In a way, Pooh is the Uncarved Block. Why? It just is. Listen to and know yourself. Everything has its own place and function. Too many people don't recognize this, and so they put up with the wrong job or the wrong relationship. They accept the status quo, having never tried to discover what makes them unique. Conversely, some people refuse to accept their own limitations to their own detriment. It doesn't mean we stop changing and improving; it just means we recognize what's there. As Hoff points out, "A way of life that keeps saying 'Around the next corner, above the next step,' works against the natural order of things and makes it so difficult to be happy and good." We always seem to have to be going somewhere. More money, better job, bigger house. Anywhere but where we are. We spend our lives chasing after what's next, what's after, and somehow it's always farther along than where we are. Likewise, the problem with our perverse obsession for saving time is that you can't save time. You can only spend it. Most people have no time at all, because they're too busy wasting it by trying to save it. And by trying to save every bit of it, they end up wasting the whole thing. Why should we live with such hurry and waste of life? We are determined to be starved before we are hungry. Men say that a stitch in time saves nine, and so they take a thousand stitches to-day to save nine tomorrow. For the inquisitive or the philosophically inclined, Laozi's classic text Tao Te Ching serves as a better primer to Taoism and higher enlightenment. 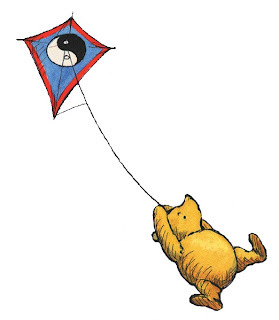 But for those of us who too often find ourselves at the mercy of the gales of daily routines or tossed about in the waves of life's demands, The Tao of Pooh hands us a compass to find our bearings, reorient our perspectives, and learn the Way.